Description: This sponge is usually white but can also be grey, pale rose, orange or sulphur yellow in colour. Several new species have recently been described from the NE Atlantic and it is likely that different forms currently identified as Clathrina coriacea are in fact distinct species. 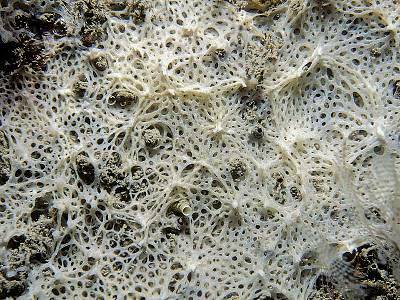 Young colonies are often thinly encrusting but more mature ones form a soft, compact network of anastomosing thin walled tubes. 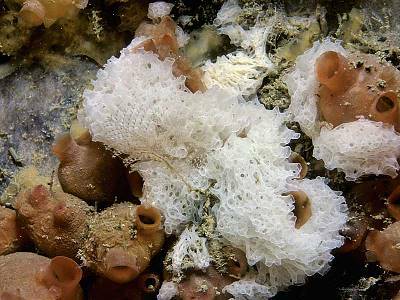 Habitat: This sponge is usually found on clean rock surfaces in the shallow sublittoral and also under overhangs and boulders on the shore. 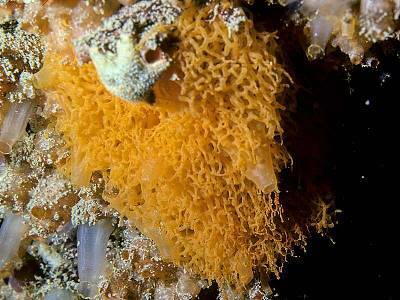 It is often found associated with the ascidian Dendrodoa grossularia in surge gullies but also in sheltered caves. Distribution: A common species complex that occurs on all coasts of the British Isles. Similar Species: This species may be confused with Leucosolenia botryoides and other Leucosolenia species which are also comprised of thin walled tubes, however in C. coriacea there are no erect free branches. Network of thin walled tubes. 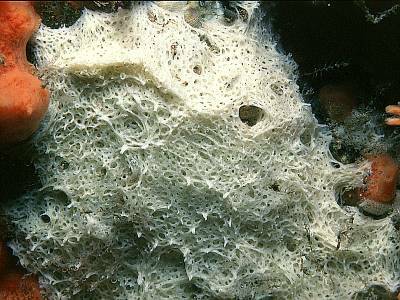 Encrusting habit or with wide base. Picton, B.E. & Morrow, C.C. (2016). Clathrina coriacea (Montagu, 1818). [In] Encyclopedia of Marine Life of Britain and Ireland.